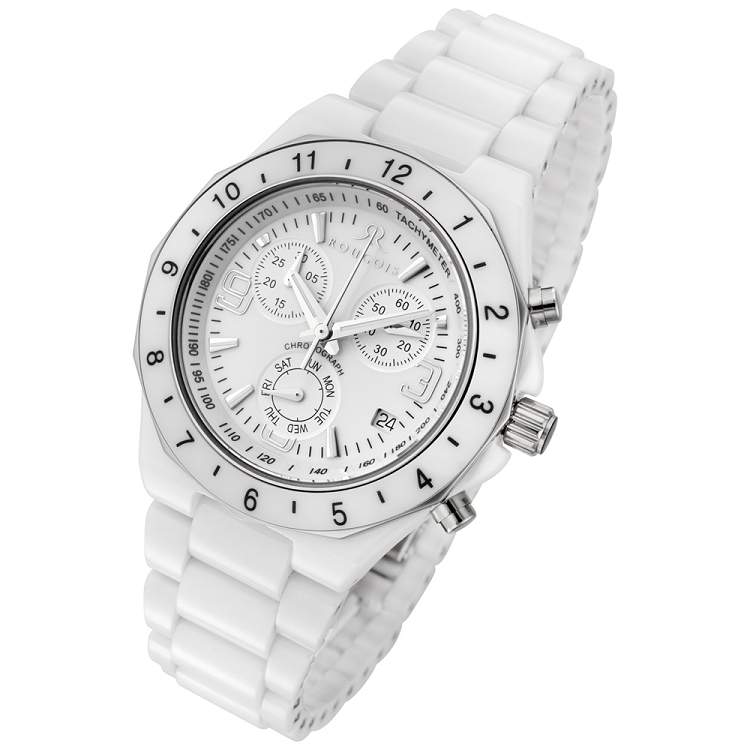 Rougois Ceramique Collection Ladies Chronograph Watch in beautiful white polished ceramic. High quality Swiss chronograph movement with the words Swiss movement on bottom of dial. Scratch resistant sapphire crystal protects the glass from any normal type scratches. The watch is water resistant to 150 feet. The right eye of the watch is the continuous second hand. The bottom dial is for the day and at the 4 position is the date. The left eye of the dial measures minutes in the chronograph mode marked at 5 minute intervals. The watch measures 1.5" wide and is 1 3/8" high. The dial is 1" wide. There are two buttons on each side of the crown which sets the time. The top button starts and stops the chrono feature and the bottom one resets the markers to "0". The ceramic band comes in one size, made to fit a wrist with a circumference of 226 mm / 8.90, but it can be resized to any wrist.